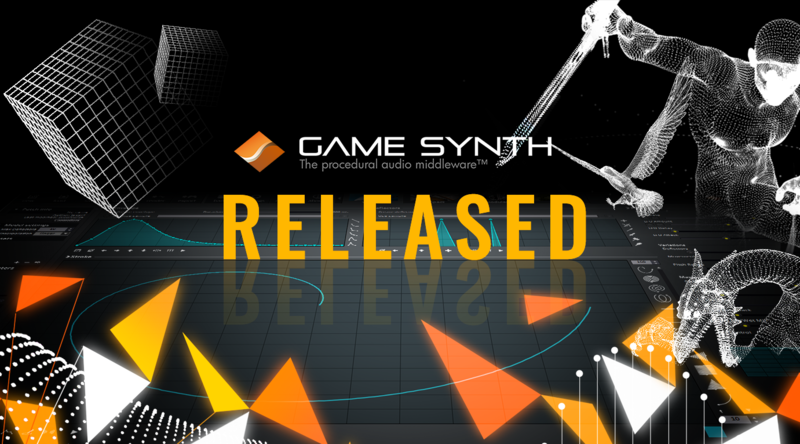 We are thrilled to announce the release of GameSynth, the ultimate sound design tool for games and movies! GameSynth uses the latest advances in procedural audio to generate high-quality, fully interactive sound effects. Creating hundreds of variations of a sound is done in just a few clicks, perfect to fight repetitiveness in a game, or to bring more diversity to the audio of a movie (bullets, Foley etc.). Among the first procedural models available are: Whoosh, Impact / Contact and Retro. Many other models (including Voice Effects and Motors) are coming soon, both from Tsugi and from our partners. GameSynth also offers a visual patching environment allowing sound designers to create their own models. GameSynth’s user interface lets you analyze existing samples to create realistic procedural sound effects, and use a mouse or tablet to draw whooshes, create contact sounds and more. The tool provides the sound designers with many features specifically aimed at games and movies, such as random ranges, meta-parameters, automation curves, or synthesis events. The sounds generated can also be exported automatically towards a game middleware such as Wwise, FMOD Studio, ADX2 or Unity. The GameSynth engine, licensed separately, can read the patches authored in the tool and generate audio at run-time in a game. Used as a standalone audio engine or in conjunction with your game audio middleware, it offers numerous advantages over sample playback, such as the run-time generation of sound effect variations, deeper audio interactivity due to its direct access to the synthesis parameters, as well as a drastic reduction of the audio memory footprint. Do not hesitate to apply here to join the beta of the GameSynth engine if you are interested.